ridden by Brad Mitchell. Hart Photography. It wasn’t a ballpark that architects of the new NCHA class restructure had in mind. But they hit a home run with the new program, which was instated by show management for the 2018 Cotton Stakes, held Sept. 1 through Sept. 9, at the Ike Hamilton Expo Center in West Monroe, La. The Cotton Stakes realized a dramatic increase in entries as a result of the addition of an Intermediate Level for all divisions. 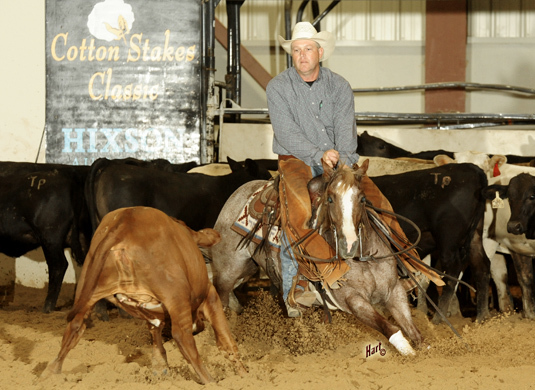 As an example, preliminary results show that 96 horses competed in the first go-round of this year’s Cotton Stakes Classic Open, as compared with 46 who competed in 2017. In addition, 65 of those 96 horses were also entered in one or more of the Intermediate divisions (to be eligible for the Intermediate Level, a horse’s rider cannot be on the Top 100 Rider list for that division). More Cotton Stakes entries also translated to bigger payouts. 2018 Cotton Stakes Classic Open champion, Somethingtobelievein, sired by Hydrive Cat and shown by her owner Brett McGlothlin, earned $11,000 for the win compared to last year’s champion, Chromed Out Cat, with a $9,000 payout. Additionally, McGlothlin and Somethingtobelievein earned $5,500 as Classic Open Intermediate champions. In the Cotton Stakes Derby, Metallic Alley, shown by Brad Mitchell for Dennis Levering, also made an Open/Intermediate sweep. Altogether, the Metallic Cat daughter earned $16,000, with $10,000 for the Derby Open win and $6,000 for the Open Intermediate win. Money won at the Cotton Stakes also counts toward the 2018 NCHA Horse of the Year race and this year’s Derby saw the top five contenders – Cool N Hot, Dual Reyish, Rollz Royce, Blackish, and The Animal – among its finalists.